As the summer heats up, interior spaces are either closed-up with air conditioning, or they get hot. Closed houses increase indoor smells, so do hot ones. Today, a guest post from Victoria Henderson, an exclusive buyer’s agent on how many people control the toxins, bacteria and dirt that can come into the house. For those who don’t practice this custom, it may seem a little odd. Taking off your shoes might feel a bit like you’re taking off your clothes. 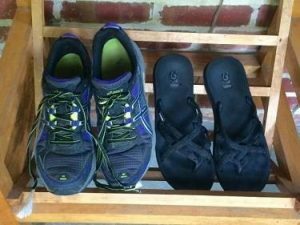 But when you really stop and consider where you walk and what you’ve walked in-taking off your shoes when entering a house makes perfect sense. I am an exclusive buyer agent with Buyer’s Edge in Bethesda Maryland. Today, I walked with home buyers all over the streets of Washington DC. Last weekend, I was with clients from out of town touring condos in National Harbor and Old Town Alexandria. At the end of a day, my shoes are filthy. Many years ago, I read an article in the Washington Post about street grime. Specifically, what we are walking in when we stroll around town. The article included microscopic photos of viruses, bacteria and other nasty things. Toxins– like herbicides, can stay on your shoes for weeks. In fact, an EPA study found 30 to 40 percent of the contaminants, including lead, are brought into homes from the outside. They suggest taking off your shoes to keep carpets cleaner. Bacteria– ever dodge a pile of dog poop on a sidewalk? Me too. But when I think about all the stuff I walk through-I remember to go barefoot in the house. E coli, fungus, gunk, grime, gasoline, cigarette ashes, trash-the list is endless! Dirt-the dirt, grime and dust of the day is on our shoes. CNN’s Dr. Sanjay Gupta offers simple advice; take off your shoes and you’ll keep nasty toxins out of your home. Victoria Henderson is a licensed Realtor in Virginia, Maryland and Washington DC. She is Associate Broker with Buyer’s Edge. I met her through NAEBA.org, where America’s Exclusive Buyer’s Agents hone their skills to help house and condo buyers.